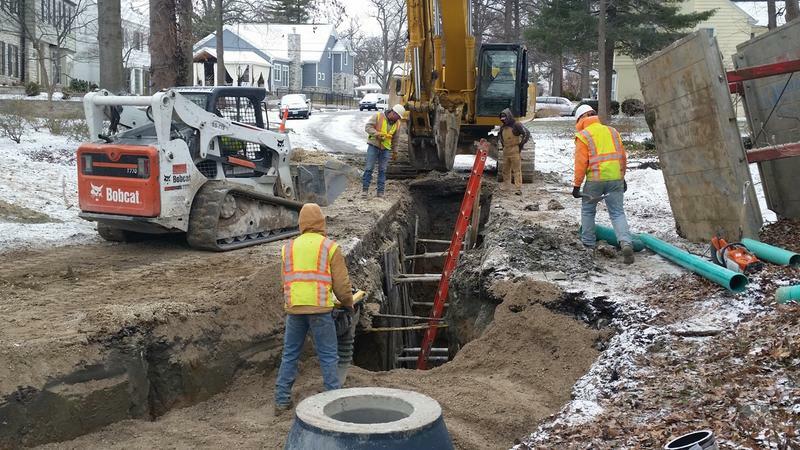 An MSD crew works on a sanitation line in Webster Woods earlier this month. Updated 3/19/15 to correct the bond amount being requested and add a link to the full rate change proposal. 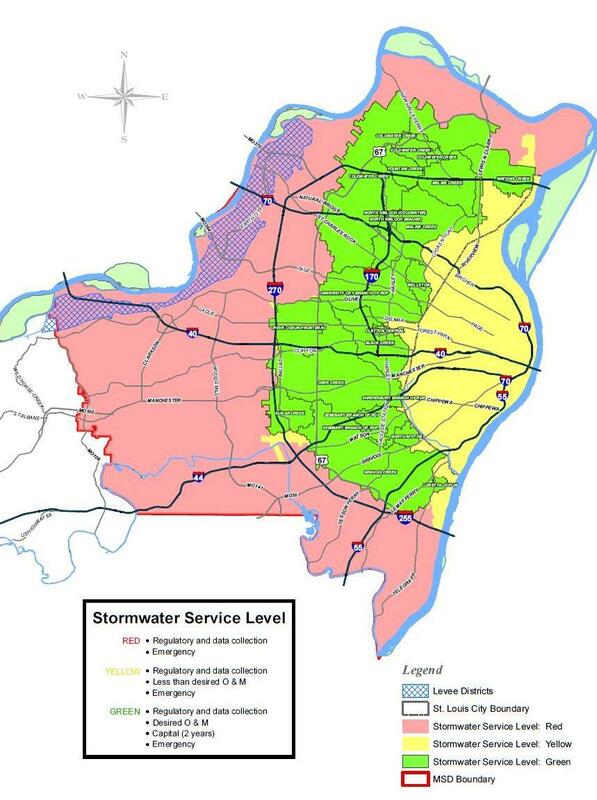 The Metropolitan St. Louis Sewer District has proposed two major changes to the rates consumers pay for services and is holding a series of community meetings to explain them. But even without the new proposals, everyone can expect to see their residential sewer rates continue to rise. According to MSD spokesperson Lance LeComb, rates have gone from an average of about $13 per month for a single family household in 2003 to about $29 in 2012 — still far below what they should be for a city this size. "We are the fourth largest wastewater utility in the United States, but our bills have not reflected that," LeComb said. Then came a 2012 consent decree with the U.S. Environmental Protection Agency and the Missouri Coalition for the Environment. It requires the district to carry out $4.7 billion in sewer system upgrades over the next 20 years. "That is work that is needed," LeComb said. 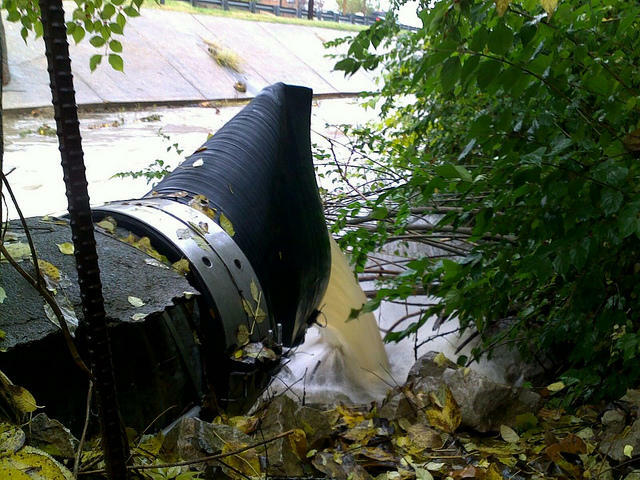 "We have sewer overflows and basement backups, and those do need to be addressed." All that work will need to be paid for by residential rate payers. The MSD hopes to soften the financial blow using bonds, so that sewer rates can rise more gradually. Voters already approved $945 million in bonds to pay for sewer upgrades in 2012. Now the MSD is asking for $900 million more. "If the public approves this plan through a bond election, probably in 2016, rates would go up by 2020 to a little over $60 per month — versus $96 per month if we don’t use the bonds," LeComb said. But with or without the bonds, rates will go up: a single family household will see its monthly bill increase from an average of about $41 dollars this July to over $100 dollars by the middle of the next decade. According to MSD, residential sewer rates would rise more gradually with the bonds but would still exceed $100/mo. by 2025. This part gets a little complicated. Right now, St. Louisans pay very different storm water tax rates, depending on where they live. If you live in the red area on the map — more or less outside of the I-270 beltway — you pay only $0.0197 in tax for every $100 of your property's assessed value. "And how much you pay determines what kind of service you receive," LeComb said. That means people in the red area get the bare minimum level of service required by law. 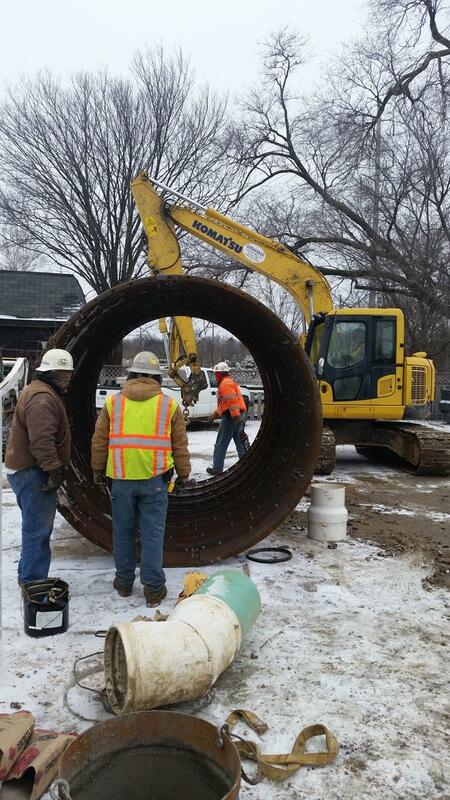 An MSD work crew installs a new man hole shaft on Kirkwood Road in early March. If you live in the city of St. Louis — the yellow area on the map — you pay that same regulatory tax ($0.0197), plus an additional $0.0682, for a total of $0.0879. And you get what LeComb calls a "middle level" of service. On the other hand, if you live in the green area — roughly between I-170 and I-270 — you pay the most: as much as $0.1879 for every $100 of assessed property value. But you also get the best storm water system maintenance for your money. "I’m going to use the city of Creve Coeur as an example, although they’re not the only example," LeComb said. "Half of Creve Coeur is in that green area, and the other half is in that red area. And literally on one side of a street, you can do a lot of storm water work, depending on what’s going on. The other side of the street — in the red area? Sorry, we can’t do anything for you." The MSD wants to change all that and have everyone pay about 12 cents of storm water tax per $100 of assessed property value. "What we want to do is bring everybody up to a consistent level of service," LeComb said. For most people, that would mean a relatively small increase in annual property taxes. People living in the green area would actually see their taxes fall. If you're curious exactly how this would play out in your part of town, check out the maps on pages 35 (green), 36 (yellow) and 37 (red) of MSD's Rate Proposal Overview. None of this is a done deal. First, the two proposals have to be reviewed by MSD's rate commission, which will hold formal hearings in May to take public comments. If the rate commission decides to recommend the proposals, it will be up to MSD's board of trustees to sign off on them. That would happen in August. Then the two proposals would go up for public vote as two separate ballot measures, most likely sometime in 2016. You can find all the details about that schedule and the dates of the public hearings, here. There's also a concise summary of the two proposals, here. And if you still want more, here's where MSD has posted all the information about its rate commission and rate proposals, including a link to the full rate change proposal (Exhibit MSD 1). The Metropolitan St. Louis Sewer District is offering as many as 50 new grants to encourage local landowners to install rainwater collection systems on their properties. The grants of up to $3,000 would fund projects like rain gardens, rain barrels, green roofs, pervious pavement and other methods that collect rainwater, known as "rainscaping." Updated 2/7/14 to correct the timeline of the lawsuit against MSD. 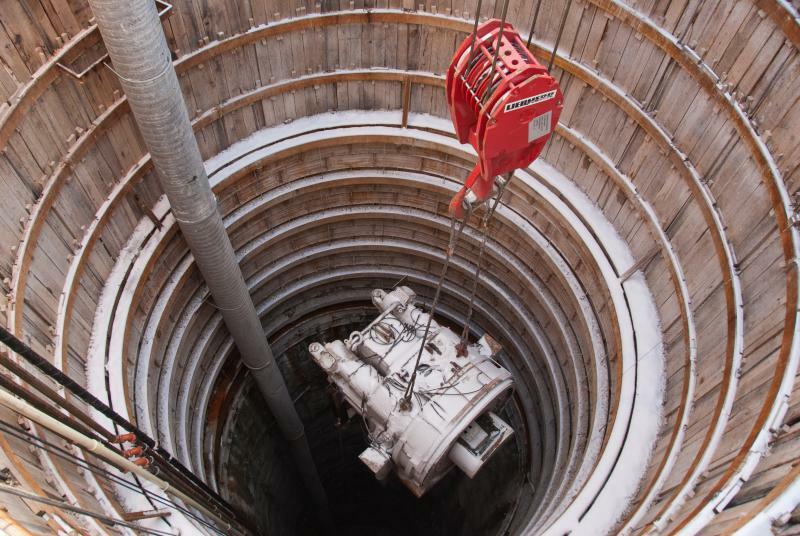 The Metropolitan St. Louis Sewer District is preparing for its first big dig. Starting in a few days, MSD will begin construction of a 3,028 foot-long tunnel under the River Des Peres, just south of Carondelet. 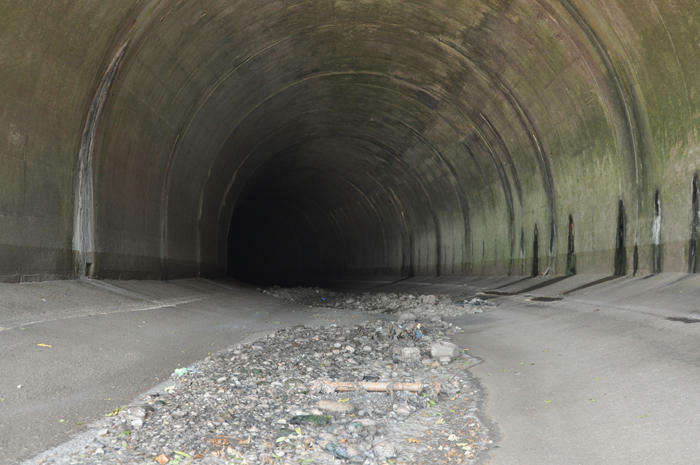 The tunnel will hold a pressurized pipe that will carry sewage to the Lemay Wastewater Treatment Plant.